Ingredients: Black beans, cayenne, Thai and scotch bonnet peppers pureed with vinegar plus poppy seeds, key lime juice and a Yeehaw Junction of spices and salt. Serving Suggestions: A great table sauce for meats, seafood, or chicken. Adds an extra bit of zip to any dish. Spices up Barbecue sauce, backed beans, or chili. Mix one to one with melted butter or margarine for a terrific Buffalo wing sauce. Try adding curry powder or cumin and granulated garlic or substitute olive oil for the butter/margarine and add minced fresh garlic and oregano. Pour mixture over cooked wings and toss until wings are evenly coated with sauce. Please write for more free recipes or send us our favorite recipe using one of our pepper sauces. Be sure to try all of the PURGATORY brand pepper sauces. Each one is made with all natural ingredients with no preservatives and our famous “HEAVENLY FLAVOR – HELLISHLY HOT” ™ taste. Editorial shorthand: Given the lengthy name, I’ll refer to Purgatory Brand Alligator Alley Asphalt as “PBAAA” throughout this review. Packaging: The sauce arrived in a clear 5 ounce bottle with black, red, and yellow glossy label, and red cap. All in all the packaging presented an appealing, professional looking product. 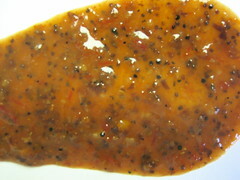 Color: The sauce was brown, speckled with black dots (the poppy seeds). Spinning the bottle over in my hand, only one or two pepper seeds are visible. Smell: The first thing I do when I open a new, untested bottle of hot sauce is to hold the thing under my nose and take a big deep whiff. PBAAA smells about like what you’d get if you bottled a bean burrito from (a certain unamed) fast food mexican restaurant, and spiked it with an extra dash of cumin. Quite “bean-ey”. Vinegar based sauces will often blast you with their vapors, but none of that here. The vinegar impact of this sauce seems very subdued. Consistency: Next, I poured about a tablespoon of the sauce onto a paper plate and tilted it slightly. It ran, but rather slowly, so I’ll call it “medium-to-thick.” There were no chunks of vegetables visible, only the aforementioned poppy and rarer pepper seeds. Taste: Pouring out another portion on a spoon, I took a taste. This is where the vinegar and salt made themselves known, but in no way did they overwhelm the bean base. I found the flavor to be quite pleasant, good enough in fact that I ate two more spoonfuls straight up. I’ve run across a few bean-based hot sauces before, and I’d have to rank PBAAA as among the best, flavor-wise. “Mellow” was the first word that came to mind. Texture: As one might expect, the inclusion of poppy seeds results in a somewhat “gritty” feel when eating this sauce straight from the bottle. When taken with food, this perception disappears entirely. Heat: The billing on the label touts PBAAA as “Heavenly Flavor – Hellishly Hot”. It certainly has a deep, rich, and unique flavor, but it falls well short on the heat claims. What heat it does have comes on slow and steady; warming rather than burning. The warmth lingers, building to its gentle peak before fading. Tabasco certainly isn’t all that hot, but it gives you what it’s got by stabbing at you in a short, sharp spikes. PBAAA never reaches the heat of Tabasco, but the journey is much more nuanced and pleasant. I’m rather surprised given the ingredient list that PBAAA isn’t hotter, but of course when it comes to heat, it isn’t the ingredient list – it’s the proportions. On a heat scale of 1 to 10, I give PBAAA a 3. Overall Impressions: Purgatory Brand Alligator Alley Asphalt is what I like to call an “eating sauce.” Mild enough to be liberally poured over food, PBAAA is particularly well suited to Mexican dishes. I can see slathering this over fast food tacos and burritos in place of the little packets they give you. It’s ill suited for something like pizza or pasta, but would work well on grilled or baked chicken. This sauce would probably work quite well as a ketchup replacement on a hamburger. I’m not sure what the odd inclusion of poppy seeds brings to the table flavor wise, but in day to day use you’ll even never notice them. Great review, worthy of a wine critic! Offtopic, is it possible for the author’s name to link to their introduction and/or their blog or even a profile? I found those link in the “About HotSauceBlog.com” link, but got there by luck. Also, it would be great if they could add pictures to their intro. Bill is the only one so far, and I’m having a hard time remembering who is who. Keep up the great work. Enjoying the increase in posting activity for sure! I live in Sarasota, Fl and would love to see how you make Jamaica Me Sweat. I love this sauce on my pizza from Honey Crust on 17th St.
I’ve been crazy about all the Purgatory sauces since discovering them on a trip to New Orleans in 2000. Unfortunately I can’t get them out here in California (no distribution) so I have to buy from the source by the case! Favorites are Cat Scratch Fever and Garlic-o-holic…try these if you haven’t already!